There are a number of different reasons why you need a pool cover. They will help to prevent debris from falling in your pool, help to keep the right amount of chemical balance and also act as a safety blanket. With all these features, getting the best pool covers is very important. In order to get the best above ground pool covers or in-ground covers, it’s important to consider all of the key features. These include the type of covers you can buy, the budget that you have and other aspects like the size. In this guide we will give you all you the information that you need and we have also completed pool cover reviews to show you the best products on the market. Once you have finished reading this guide, you’ll know how to get the perfect pool cover for you. This is a great cover for reducing your heating costs. There are many size options from Sun2Solar, but this one is for a 4’ by 8’ pool. If you want a larger size, then there are options. If you want a smaller size, then you can trim this one. The clear cover allows for the sun to penetrate and not only warm the cover but also warm the water below. The warmer your water, the less you have to pay to heat the water, and the more money you save. The longer you have this cover on your pool, the more it will pay for itself. If you do need to trim it, you can do so with regular scissors. The great part is that if you do trim it, it does not affect your warranty. Cut the cover with confidence that you are not destroying your solar cover. This circular solar pool cover is desired for a pool with a 15-foot diameter. 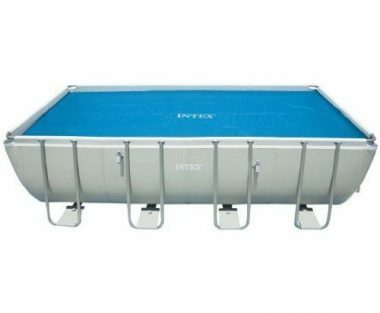 If you want options for a smaller or larger pool, then Intex have other size options for you. 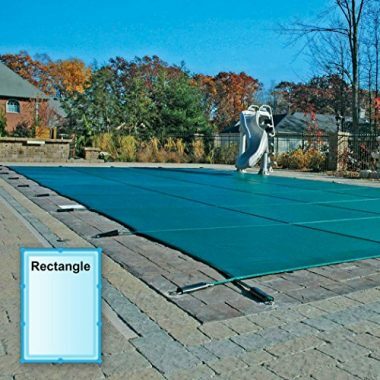 We love that this solar cover helps you to retain the heat in your pool better than a regular cover. Place it just inside the walls of your pool and allow it to float on the surface. This cover will reduce evaporation by up to 95% and will seal the heat inside. When you are not using the cover, there is a carry bag which you can use to store it in or transport it. Always make sure to dry the cover off before transporting and storing. If your pool measures 17’8” by 8’4”, then you are in luck, as this cover is going to fit your pool exactly. You can trim it for smaller pools, but Intex has a selection of other pool covers to fit your needs. There are U-shaped poles on the side, and straps which run from one side to the other. This stops the cover from falling into the water. This will help to keep the heat in your pool, and great for covering the pool overnight. When the cover is not in use, it folds up very small, and even comes with its own carry bag for more effective transportation and storage. 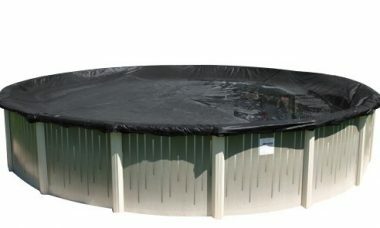 This circular pool cover is for above-ground pools and will cover a pool with an 18-feet diameter. There are, of course, options for smaller and larger pools. As with all solar covers, this one helps to limit evaporation and seal in the heat. What we love about the cover is the fact that the cover is coated with UV protection. The cover will resist the effects of the sun and last longer than other solar covers. 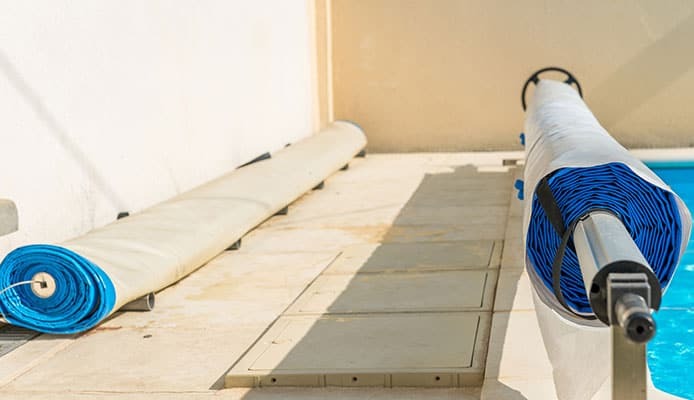 The cover can actively raise the temperature of your pool by 15 degrees F. It also comes with a 3-year warranty, should anything go wrong with the cover. This cover will last for a long time, and if it does not, then you are covered. 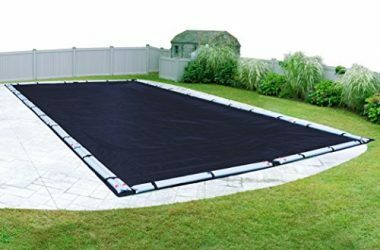 This cover will cover a 16’ by 32’ pool, but if you have a bigger or smaller pool, then there are a number of pool covers for you to choose from. The high-quality and heavy-duty polyethylene material will keep your pool protected and will not bend and bow under pressure of water or debris. There is a 5-foot overlap to ensure that nothing slips into the pool. The 10-year warranty ensures that you have peace of mind for years to come. This cover is for 20’ by 40’ pools. There are also smaller options if you need them. The cover comes with a drill and tamp anchoring system which permanently secures the anchors to the ground around the pool. 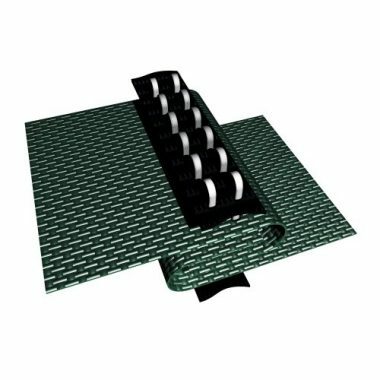 The multi-seamed stitching creates strength in the pool cover and makes it one of the most durable covers on the market. The mesh will let the water through but stops any debris such as leaves. You can be sure that the mesh cover will hold up to any weather conditions while helping to keep your pool clean and dirt free. This cover comes with brass anchors for you to anchor in the concrete around your in-ground pool. The brass anchors and stainless steel springs are durable and solid. Once you have hooked the cover to the springs, you can be sure that it is going to stay in place no matter what happens. This cover is specifically for a 16’ by 32’ pool. We love the rich forest green color of the cover and the solid construction. The fact that the cover comes with an installation tool and storage bag is only a bonus. This is a great cover for your round pool and will fit a 24ft diameter. Of course, you could have it fit a smaller pool and have it overhang more. With a 24ft pool, the overhang is 2ft all the way around. The cover comes with a vinyl coated cable and winch, along with UV protection. The UV light inhibitor protects your pool from the sun. The cover also comes with a 3-year full warranty and a 12-year limits warranty. If you use your cover as instructed and take care of it, then you are not going to have anything to worry about. There are many pool covers, and not all pool covers are created equal. Your choice will depend a lot on your needs and also your budget. There are many different types of pool cover, including solar, thermal, and winter covers. Let’s take a closer look at each. Solar pool covers are among the most affordable pool covers. They are sometimes referred to as bubble covers, but solar pool covers cover your pool and absorb the sun’s heat to keep the pool from losing as much heat as conventional covers. The heat which is absorbed during the day is used to insulate the pool when the cooler temperatures set in. 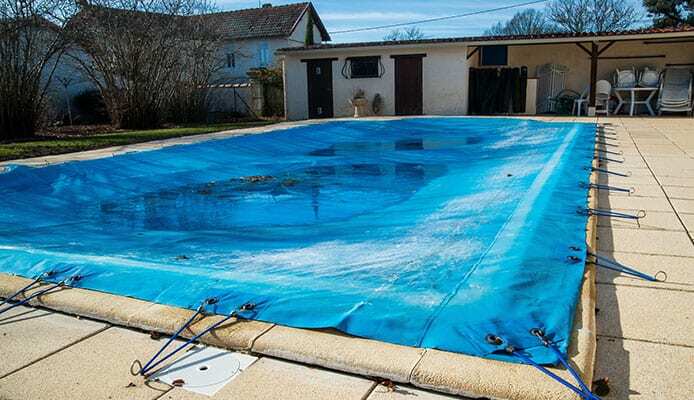 As far as pool covers go, this is the only cover which can increase the temperature of your pool. This cover will do a similar job to most pool covers. It will keep dirt and debris out while keeping the heat in. 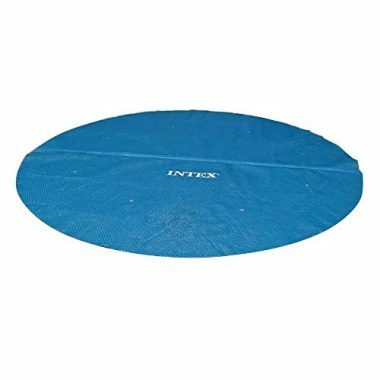 The main disadvantages of these types of covers are that they are hard to get on and off, and they will also not support any weight. Automatic pool covers are set up to be used at the touch of a button. They can be more expensive than other covers, as they need to be installed on your pool, but they are the easiest cover to use. They are generally sturdy and durable. They will support weight but they will not do much else except cover your pool. Thermal pool covers have insulating foam inside to keep your pool insulated. They are as effective as solar covers at keeping the water hot inside, but they will not heat the water. Solar covers may heat the water, but thermal covers last a lot longer. They block UV rays and are not damaged by them. They are also easier to get on and off your pool that solar panels. On the downside, they are more expensive than solar covers. If you need to keep your pool covered over the winter, then you should invest in a winter cover. They are specially designed to provide a barrier against extreme temperatures, winter winds, frost, snow, and freezing rain. The great thing is that they can be used year round. They are inexpensive and very easy to install and use. They will keep dirt and debris out of your pool, but they are not designed to keep any heat in the water. As the name would suggest, hidden pool covers are covers which are hidden. They are usually contained on one side of the pool, with a lid to hide the cover and the roller on which it is installed. You should choose this cover if you want easy access to your cover, but also if you do not want an unsightly cover to be visible. These covers can be expensive, especially if you are installing an automatic, hidden pool cover. When you come to choose your pool cover, there are more choices than just the type of cover. You can also choose between solid covers and mesh covers, but why would you want to choose between the two? A mesh pool cover will allow water to flow through the cover and into the pool. Any rain or snow which falls onto the cover will seep through into the pool water below. A mesh cover is lighter than a solid one and easier to install and use. When water does fall on the cover, you do not need to worry about pumping it off of the cover. When leaves fall on the cover, they will not fall through the small holes. As the leaves dry, the wind will blow them from the cover, making your life easier. You may have to clean your pool more with a mesh cover protecting it. A solid cover will not allow any of the water through, but you will need a pump to get rid of the water on top. A solid cover keeps the water below fresh and clean. It will also help to keep the heat in better. 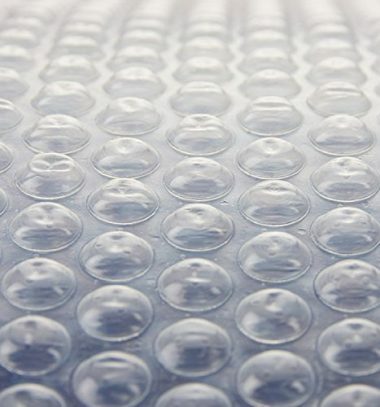 Solid covers are heavier than mesh covers and can be more difficult to use. Obviously, your budget will play a big part in your decision. The more you are willing to spend, the better a pool cover you will get (generally). You will also need to decide if you want a mesh cover or a solid cover. A hidden cover will set you back more too. If you want a cover which supports some weight, then that will cost. If you want a pump to pump the water from your cover, then that will cost too. Basic covers can be extremely cheap, but you should also consider the savings in heating your pool if you can find a cover which keeps the heat in effectively. If you are using your pool year round, then you need to get a cover which will be effective year round, especially if you live in a climate which has snow in the winter or other extreme weather conditions through the year. You will also have to decide if you are going to stop using your pool over certain months of the year or using your pool in all four seasons. The aim of a pool cover is to keep debris out of your pool and keep the heat in. To keep debris out, a pool cover creates a barrier between the outside world and the water in the pool. Even mesh covers will not let leaves and twigs in, even though it lets the water through. Mesh covers are not as effective as other covers at keeping the heat in as they allow the evaporation to get out. The more a pool cover can stop the evaporation from getting out of the pool, the warmer the water will stay. The size of your pool will determine the size of your cover. You can make a bigger cover fit, but you cannot make a smaller cover fit. If you’re worried about being able to take a large cover on and off again, then a pool cover reel is going to be able to do the job for you. The bigger the pool you have, the more you have got to worry about in terms of safety. A pool cover can help with that but it’s also a good idea to get a pool fence too as well as a pool alarm to ensure you’re as protected as possible. While pool covers can keep most of the debris out of your pool, you’ll still need to invest in a great pool cleaner as it’s impossible to keep your water 100% clear. You would be able to use this in conjunction with your cover and a pool skimmer, along with your pool pump and pool filter system. Q: How Do Solar Pool Covers Work? A: Pools lose heat through heat transfer. The water in the pool will lose temperature through everything it is in contact with. This includes the pool itself, but most of the water will be lost through evaporation into the air. A solar cover works by trapping the heat of the sun in the cover and reducing the heat transfer and evaporation. As the water in the pool evaporates, it rises and condenses on the underside of the cover. When the cover has stored heat, the water is heated and drips back down into the pool. The solar cover creates a barrier for your pool, and not only can it keep the water temperature hot, but it can actually increase the temperature of your pool. Q: How Do You Clean Pool Covers? A: You should pump off the water as it begins to accumulate on your pool cover. You should also remove dirt and debris as they begin to accumulate on the top of your pool cover. You can do this by sweeping them off. If your pool cover is small enough, then you will be able to do this from the sides of the pool. If you have a hard cover, then you can stand on the cover and sweep, as long as it can take your weight. If you have a soft cover, then sweep as best you can, and if the debris gets too much, you can take the cover off to sweep it. Use a mix of one part bleach to ten parts water to clean the underside and topside of your cover. Make sure to clean away any signs of mold, dirt, and mildew. You want to stop the growth of any bacteria which could get into your pool water. Rinse the cover and then allow the cover to dry in the sun until there is no moisture left on the cover. Q: How Long Do Solar Pool Covers Take To Warm Up A Pool? A: If you live in an area where the temperature is warm and consistent, then it can take as little as a few hours for a solar cover to transfer enough heat into your pool to be swimmable. You could get a solar pool heater though that will further boost the heat you have. In a warm area, your pool could naturally be heated enough by the sun to warm your pool enough. If you live in a colder climate, then a solar cover will transfer heat to the water, but it may not be enough to warm the pool enough. In colder climates, you will want a separate pool heater for your pool, and use the solar cover to keep the pool hot and top up the temperate occasionally. Q: How Do I Install A Pool Cover? A: Installing a pool cover correctly will ensure that it does exactly what it is supposed to do, and it will ensure that the pool cover lasts as long as possible. If a pool cover is installed wrong, then it can damage the pool cover and possibly the pool. Installing a pool can be tricky work, and if you are ever in doubt, you should hire a professional to do it for you. Having said that, installing a pool cover is something which you can do by yourself. If you are installing a hidden pool cover or another hard cover, we recommend having someone come in and install the cover for you. If you are installing a soft cover, such as a solar cover, then you should have no problem installing it on your own. Have a friend come around to help you. Take your solar cover and place it on your pool, with the bubble side facing down. Flatten the cover so that as much air as possible is removed from the underside of the pool cover. Have your friend hold the pool cover in position, and use a pair of scissors to cut the pool cover to shape. Take care to not cut the cover too short as the cover will shrink a little over time. Have a small amount of overlap up the side of the pool. If you spend the time to research your pool a little and find out when you are going to be using it, and in what environment, then you will have an idea of what type of pool cover you need to get and if you need additional warmth and other factors. We’ve given you all the information you need to make the right choice for when you purchase your pool cover. When you do, you’ll have the peace of mind of knowing that no debris will get into your pool, you’re keeping the water clean and the pool protected.